The Ravelry Loom-a-long group will be working on Wingspan for Loom Knitters during April and May. Please come and join us. We will be making both the original Wingspan for Loom Knitters, shown in the second photo, as well as Wingspan In Lace, shown in the third photo. 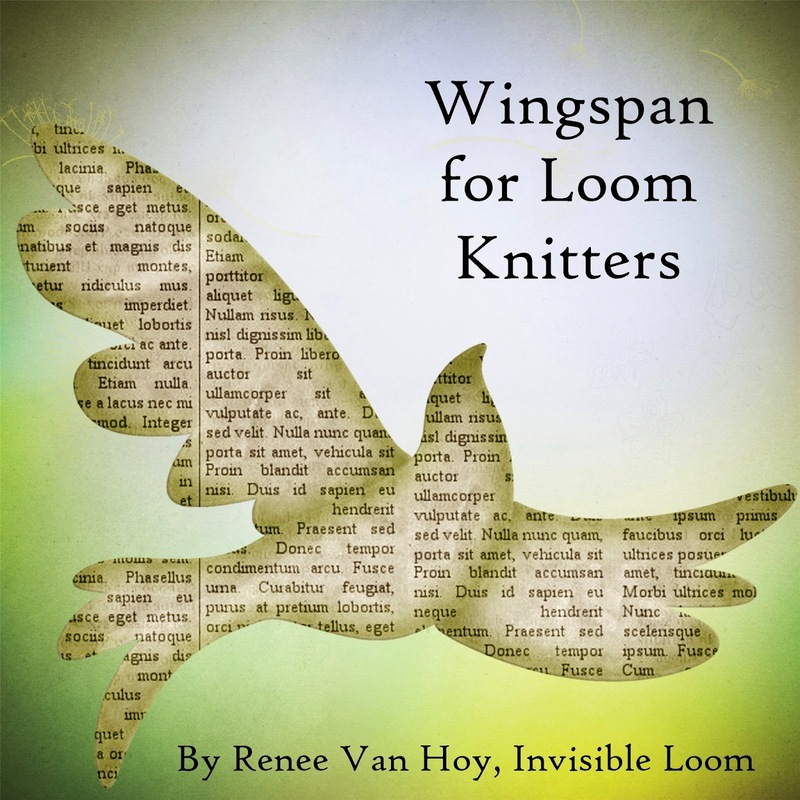 The patterns are both in the Wingspan for Loom Knitters e-book, which also has information on how to size your Wingspan from a scarf to a large shawl, and for using looms in 3/8, 1/2 and 3/4 inch gauges. I hope you will come join us for this fun project. 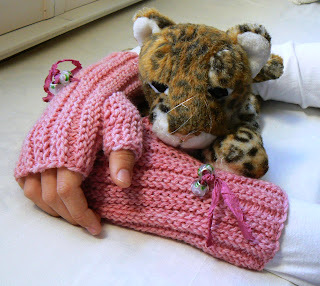 I am very happy to tell you about my new pattern collection, "Kitten's Lost Mittens". This e-book has three patterns, two for fingerless mitts, and one for a full mitten. The ideas for these mittens came from a long standing "quest" in the Ravelry Loom Knitters group, to find a better thumb for our fingerless gloves. The usual "add on " thumbs had an uncomfortable seam at the base, and stuck out in an unnatural angle. The "flap" style thumb was not open for a true fingerless mitt, and had a funny square shape. Other thumbs lacked a gusset at the base to allow for the natural shape of the hand. Hopefully these patterns have solved many of these issues. The first pattern, seen in the two photos above, is "Little Kitten Mitts". 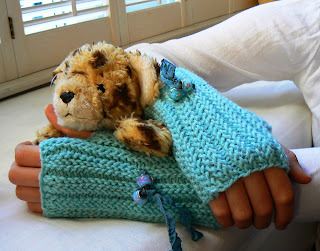 This is a basic fingerless mitt with a low thumb gusset. This makes the mitts fit comfortably on a variety of hand sizes. The mitts are made entirely in one piece, on any basic 3/8 inch gauge loom. They adjust in size for adult hands small/medium/large, and may be customized to change the length of the mitt to your preference. 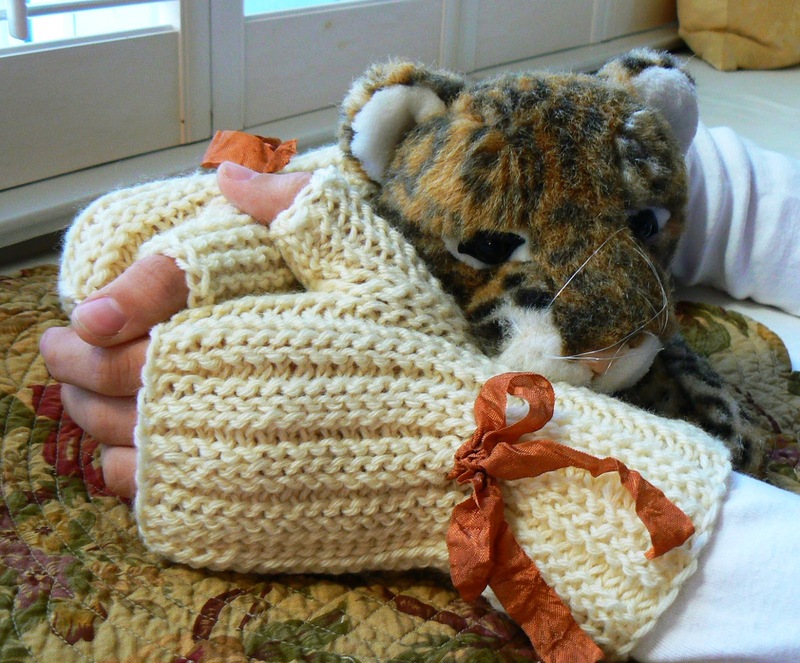 Little Kitten Mitts knit up quickly, and make a perfect gift. The second pattern, seen in the photos above, is "Big Kitty Mitts". 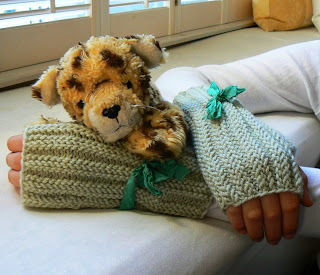 These fingerless mitts feature an extended thumb, with an open top. They have the same adjustabilty and other comfort features as Little Kitten Mitts, as well as a one piece construction on any 3/8 inch gauge loom. 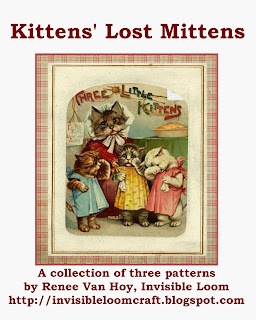 The third pattern is "Mittens for Kittens", seen in the photos above. This is a classic style mitten, with a softly rounded top and full thumb. 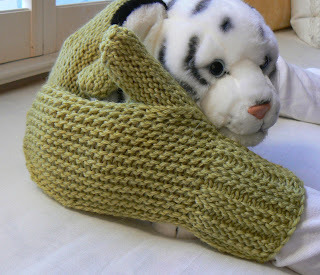 The same gusset is featured, giving the mittens a very comfortable thumb. 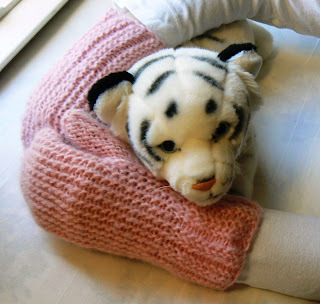 These mittens are sized for a small/medium/large hand, and the size may be customized to your liking. Any 3/8 inch gauge loom will work with this pattern. 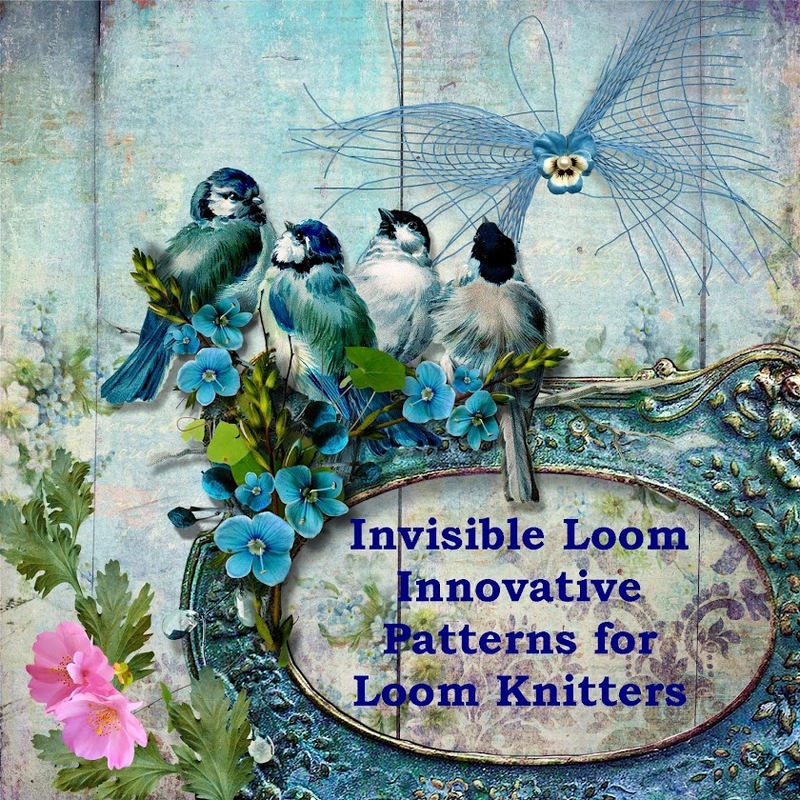 As with all Invisible Loom e-books, there are two pdf file versions included; a large print 24 point font plain text version, and a paper saver 12 point font plain text version. In addition, the e-book contains a cover, two pages of figures for customizing size and embellishing your mittens, and three pages of photographs. The files are tablet and e-reader friendly. Print or read your patterns just the way you like. 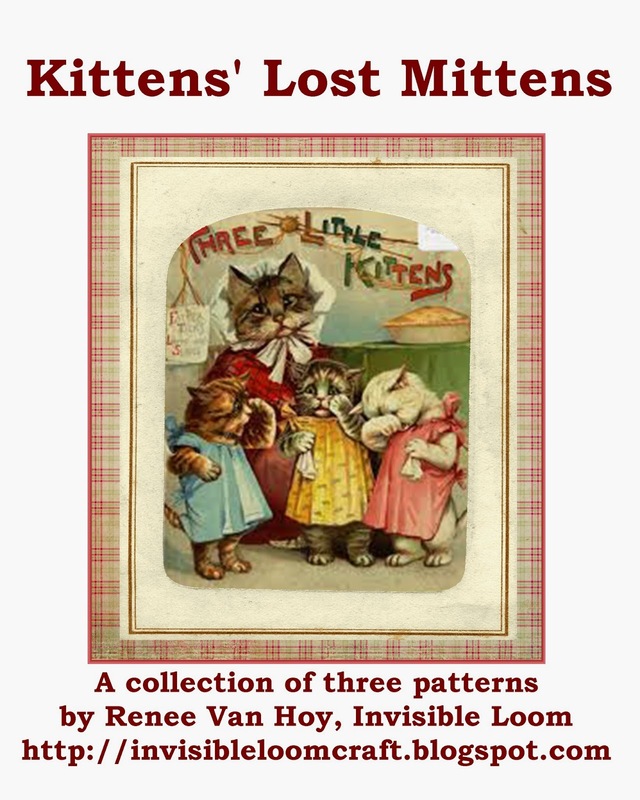 I hope that you and your kittens enjoy these new patterns!